Electronic ebook format. A relative value system established by national surveys of physicians and dentists conducted by Relative Value Studies, Inc. A full spectrum of CDT and CPT codes are valued. 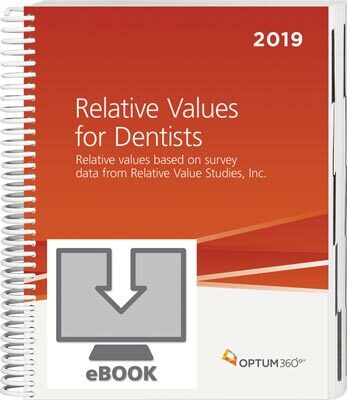 Relative Values for Dentists is a relative value system established by national surveys of physicians and dentists conducted by Relative Value Studies, Inc. With this tool you can establish, defend, and negotiate fees for dental procedures billed with CDT or CPT® codes. Relative values are based on the actual clinical work performed. Feel confident and assured of a neutral relative value scale. Conversion factor benchmarks for CPT® codes. An additional tool to help you start or update a relative value-based fee schedule. Relative value scale is based on physician and dentist survey data. Rely on a resource free from government budgetary influence. Access RVUs from one resource based on services that are similar. Values for CPT® and CDT codes are included to help determine fees for the dental services you perform. Printed book, downloadable eBook, or data file. Choose from three format options.